July 1st is upon us and with it fireworks, red and white fashions, barbecues and flags galore! 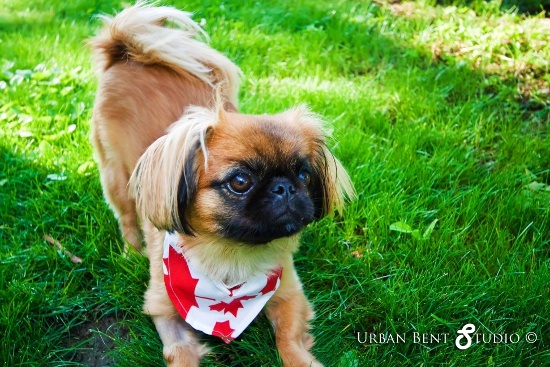 How do you celebrate the nation’s birthday with your pet? Write to us and share your best Canada Day stories! We’d love to know! As I was running around in the rain the other day, connecting hoses to sub-pumps in an attempt to prevent our basement from flooding, I was struck by an idea. I wondered how wonderful it would be to grow a fine fur coat like my dog. With such a fine fur coat, I could stay warm in the rain and simply shake the water off once I was back inside. Unfortunately, genetics are not so kind. I have to strip down to my skivvies in the kitchen and then dance in front of the stove to warm up. Later the next morning, once the rain had stopped and we had stemmed the flow of water, I finally had an opportunity to put down the shop-vac and get some sleep. I dragged myself as far as the living room couch where I fell in an exhausted heap, grabbing the dog’s blanket from the floor to keep me warm. When I at last woke to the smell of bacon and pancakes, I crawled off the couch and found myself (perhaps not surprisingly) cover from head to toe in dog hair. Hearing my dismay, my Mum came into the living room and handed me a cup of tea and a lint brush. A half hour later, I was seated at the kitchen table, eating pancakes with one hand and staring at the collection of dog fur in my other. It wasn’t long before my mind turned back to my desire for a fur covering. I knew you can spin sheep’s wool into yarn, but can you spin dog fur? Before I went and sheared my poor dog to make myself a sweater, I figured it best to one; learn how to spin, and two; find out if it is possible spin other fibres beyond the traditional sheep, llama and alpaca. As luck would have it, I have a friend who knows how to spin wool. After a quick call and a promise of an appearance in my article, I was soon seated beside Ashley Kowalchuk, local “spinster” as she jokingly calls herself. She took great pains to explain to me the various pieces of a spinning wheel, and the process of taking wool from the back of a sheep to the yarn in a finely knit sweater. Not only did I learn how to spin wool, but that you can spin flax. Flax, however, requires a slightly different spinning wheel, a larger one that has a spindle with great big spikes to grab the flax (by the by, it’s on a flax spindle that Sleeping Beauty pricked herself in case you were wondering). As I watched Ashley work effortlessly at the spinning wheel, keeping her foot in rhythm and feeding carded wool into the spindle, I asked the question pressing at the back of my mind: is it possible to spin dog fur? She took a second before admitting that she had heard of people spinning dog fur before, but couldn’t say for certain if it could be done. She went on to explain that sheep’s wool is barbed and grabs at itself, which is what makes it so great for spinning into yarn. Dog fur, on the other hand, isn’t barbed and probably wouldn’t be the easiest to spin. She did concede that you could probably make a blend of sheep and dog fur, and then spin that with fairly good results. With my ego still bruised from my last run in at the library, I decided it was best to do a little more research from the safety of home. So away I clicked, the findings very much supportive of the statement, “Yes, you can spin dog fur!” The trick is in having fur that is longer than two inches, otherwise it has to be blended with wool or another similar fibre. It’s also important to note that dog fur is non-elastic, unlike wool, and garments should be measured as though you are using a cotton thread or yarn. 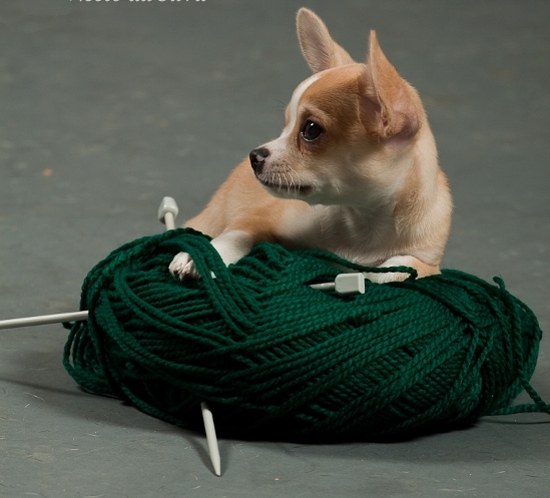 Like other yarns, dog yarn can be plied to give you a thicker thread. Plying takes two strands of yarn and winds them together. 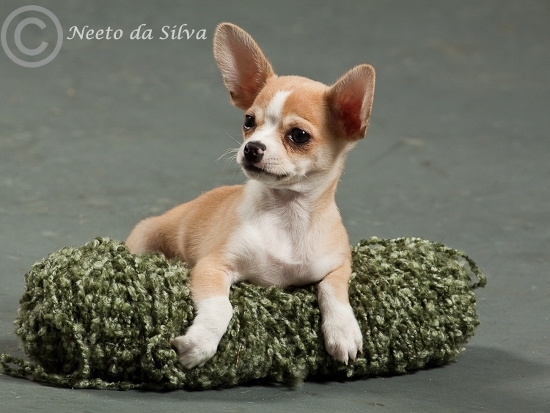 Some of the best results for dog yarn come from dogs with a nice undercoat. When grooming your dog, simply keep the shedding furs from the brush. Separate the undercoat from the coarser guard hairs. Wash and clean the undercoat, card, spin, then knit! Soon you’ll have your very own humane and eco-friendly fur knit sweater! Or, if you’re like me and enjoy a little irony, you could sheer your dog and then knit them a sweater to keep them warm! Providing you can handle a pair of knitting needles, of course. If you were perusing British newspaper headlines in 2002, you may have come across the story of Bramble the dog. Bramble, who had recently celebrated her 27th birthday, was then considered to be the oldest living canine in the world. While any dog living to be 189 dog-years-old is remarkable, what had many pet owners talking was the fact that Bramble, a border collie, had been fed a strict vegetarian diet since the age of two. Be it for improved health, environmental reasons, or ethical beliefs, more and more Canadians are choosing a vegetarian diet. Dietitians of Canada estimate that four per cent of Canadian adults currently eat meat-free, and this number is increasing steadily. Many vegetarians are looking beyond their own diets, however, and asking whether it is safe and healthy for their pets to go meatless as well. But according to Ellen Munro, a veterinarian technician at the West Carleton Animal Hospital, it is not just vegetarian pet owners who choose a vegetarian diet for their dogs. “The most common reason for dogs being fed vegetarian diets is allergies, often skin sensitivities to the protein source,” she says. Donna Rafalski, manager of the Natural Pet Foods in Ottawa, has seen a rise in vegetarian dogs in recent years. She notes that owners are turning to vegetarian diets for health reasons more so than ethical ones. Like Munro, she sees a few dogs that are vegetarian because their owners are vegan, but they make up a very small percentage of her vegetarian customers. “Dogs often have reactions to the animal byproduct protein, so owners need to find other protein sources, such as vegetarian diets,” says Munro. While there is some anecdotal evidence, like Bramble’s story, that suggests pets can thrive on plant-based meals, feeding your pet a veggie diet can be very tricky and requires careful planning and monitoring by you and your vet. Dogs, like humans, are omnivorous and thus have an easier time becoming vegetarians than cats do. Their nutritional needs are less strict and many of the nutrients they get from meat can be found in plant foods or supplemented. That being said, some veterinarians suggest waiting until after puppyhood to make your dog’s diet meatless. Getting the nutrient balance just right during the development and growth stage is a tricky business, and getting it wrong can seriously jeopardize your pup’s health. A plant-based diet may not be a great choice for a pregnant pooch either. 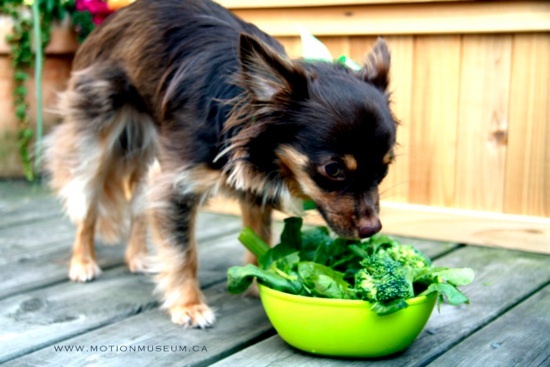 As a further challenge, many plants and veggies are unpalatable to dogs. If a dog has been raised thus far on a meat diet, the change to veggie meals will have to be a gradual one. According to PETA, the critical nutrients to monitor for a dog are protein, calcium, and Vitamin D, along with the amino acids L-carnitine and taurine. Deficiencies in these nutrients can result in a life-threatening heart condition. Cats are a very different matter altogether. Felines are considered ‘obligate carnivores,’ meaning that the nutrients they glean from meat are absolutely critical to their health. Especially crucial nutrients are vitamin A and taurine, which are involved in hearing and sight respectively, and are extremely difficult for cats to synthesize from plant sources. At the West Carleton Animal Hospital, Munro has not encountered vegetarian cats. “We also don’t seem to see many food allergies in cats. It’s primarily an issue with dogs,” Munro states. Mindy Bough, senior director for the American Society for the Prevention of Cruelty to Animals, told ABC that she has heard of healthy vegetarian cats, but that she suspects that many felines who are being fed vegetarian diets are in fact supplementing these by hunting on their own meat. While nutrient supplements are available for vegetarian cat diets, a 2001 study on pet diets found that even cats who had received taurine supplements were still dangerously deficient in this amino acid. Rafalski echoes this study’s findings. “Dogs can be vegetarians. Cats cannot,” she asserts. Whatever your reasons to convert your pet to a plant-based diet, it is crucial to do your research and consult your vet extensively. 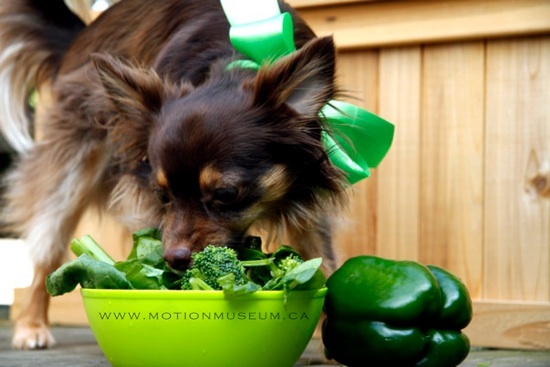 Be prepared that a veggie diet may not be a feasible option for a pet with special conditions. Once you get the okay from your vet, you can set your sights on beating Bramble’s record.